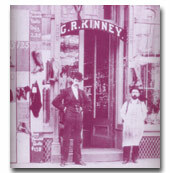 Kinney Shoes - The Great American Shoe Store! In 1894, an ambitious young man named George Romanta Kinney revolutionized footwear retailing by offering popularly priced shoes to working Americans. One hundred years later, the Kinney Shoe Corporation was the nation's largest and most powerful footwear retailer. At the age of 17 in 1883, George left his widowed mother and his sister behind in Candor and went to work in Binghamton, New York, for Stone, Goff and Company, a large manufacturer and wholesaler of boots and shoes. Business was "dull," he wrote his family in 1885, and in that year he moved to the Lestershire Boot and Shoe Manufacturing Company, then the largest footwear manufacturer in upstate New York. During his ten years as a clerk at the "Lester Shoe Company," as it was commonly know, Kinney acquired a thorough knowledge of the shoe business, helped support his family back in Candor, and paid off his father's debts. This ambitious young man, George Romanta Kinney revolutionized footwear retailing by offering popularly priced shoes to working Americans. His developmental concept of superb service to customers, a commitment to local communities, the best footwear for the price, ample opportunities and rewards for all employees, and a fierce dedication to entrepreneurship remained a steady corporate-wide goal through the years. From the humble beginnings of high-volume, low-priced shoe retailing in the 1890s, George Romanta Kinney expanded his business so that it became the largest footwear chain in America. In the 1920s, the Kinney Company launched its own manufacturing operations. In the 1950s, freestanding stores along highways and "strip" stores in small shopping centers close to new suburban housing developments. On September 16, 1998, Venator Group (Woolworth renamed) announced: "Kinney and Footquarters To Close Its Operations: The Company announced today that it is exiting its Specialty Footwear operations including 467 Kinney Shoe stores and 103 Footquarters stores." Kinney Shoe Corporation would no longer serve as the Great American Shoe Store. What was it about Kinney that made it so special? Harold C. Rowen, President and chief executive officer of the Kinney Shoe Corporation, 1994 stated in the book, Retail Revolutionary: Kinney Shoe Corporation's First Century in Footwear, "The history of our company... is truly one of "ordinary people doing extraordinary things." What made Kinney Shoes so special was the people... and Kinney lives on in the hearts of those individuals. One former Kinney Shoes manager wrote, "I spent 26 years with Kinney Shoe and a little bit of me died when my store closed." Another former Kinney employee wrote, "I know that Kinney was a place of business, but I found healing, hope and friendship in Kinney. There has never been a place to compare. I loved Kinney, the work I did and the people that I met there." Kinney also lives on in Foot Locker, Inc. G.R. Kinney's concepts of superb service to customers, a commitment to local communities, the best footwear for the price, ample opportunities and rewards for all employees, and a fierce dedication to entrepreneurship remain the heartbeat of the world's finest athletic shoe retailer. 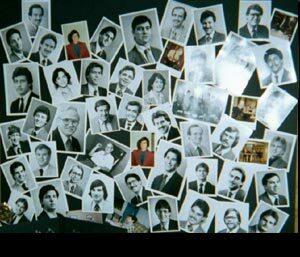 Memories - of the way we were.